"The warmer, wetter climates of the early Holocene created a few regions of abundant and diverse plant life that formed rich 'Gardens of Eden' for local foragers. In some of these regions, resources were so abundant that foragers could settle down in permanent communities or villages. Recently, nine-thousand­-year-old circular stone houses have been found on the Dampier Archipelago, off the coast of Western Australia. "Population pressure may also have encouraged the Natufians to become more sedentary. 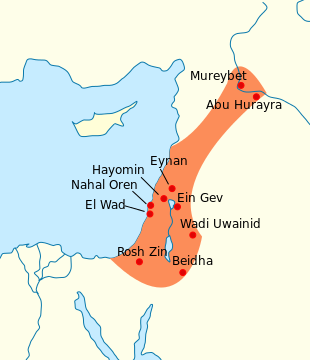 There are a lot of Natufian set­tlements, which suggests that populations were growing fast in the Fertile Crescent. That is not surprising, because the Fertile Crescent lay across major migration routes between Africa and Eurasia, which may have funneled in new arrivals. "Settling down encouraged further population growth in sev­eral different ways. Foragers, who were well aware of how few people the land could support, often tried to limit population growth. However, in villages, infants no longer had to be carried and they could eventually be put to work. That changed attitudes to families, to children, and to gender roles. In villages, having lots of children provided plenty of labor for the household as well as protection and care for the old. That's why, in most seden­tary communities, women were expected to bear as many chil­dren as they could, partly because they knew that perhaps half would die before they reached adulthood. Such attitudes sharp­ened differences in gender roles and ensured that most women's lives would be dominated by the bearing and rearing of children throughout the agrarian era of human history. The same rules explain why, within a few generations, many villages of affluent foragers faced the challenge of overpopulation. Palestine, and a long arm extending into Lebanon and Syria. "As populations grew, the Natufians had to extract more resources from the land. That meant grooming the land more carefully, and eventually it meant taking up some form of farm­ing. The Natufians were falling into a honey trap. They had built their first villages in what seemed like an ecological paradise, but within just a few generations, they faced a new population crisis, and because neighboring communities were also growing fast, they could not just use more land. Instead, they had to use whatever tricks they knew of to increase the productivity of the land they already had. These pressures pushed them, probably reluctantly, into the tough life of farmers, and as they learned what it meant to be farmers, they forgot what it meant to be for­agers. As always with collective learning, the accumulation of new knowledge eclipsed ancient knowledge and insights. Simi­lar pressures would transform foraging communities in many different parts of the world as populations grew. "Some of the best evidence for the transition from affluent foraging to farming comes from Abu Hureyra in the north of modern Syria, near the Euphrates Valley. ... The human remains reveal how tough life could be for the first farmers. All have heavily worn teeth from a diet dominated by grains, though tooth wear diminishes with the appearance of pottery, which made it possible to pro­cess grains into gruels. Women's bones show clear evidence of wear from long hours of rocking back and forth on their knees as they ground grain. "We can be pretty sure that the first farmers took up farming reluctantly, because living standards seem to have declined in early agrarian villages. The skeletons found in early farming vil­lages in the Fertile Crescent are usually shorter than those of neighboring foragers, which suggests that their diets were less varied. Though farmers could produce more food, they were also more likely to starve, because, unlike foragers, they relied on a small number of staple crops, and if those crops failed, they were in serious trouble. The bones of early farmers show evi­dence of vitamin deficiencies, probably caused by regular peri­ods of starvation between harvests. They also show signs of stress, associated, perhaps, with the intensive labor required for plowing, harvesting crops, felling trees, maintaining buildings and fences, and grinding grains. Villages also produced refuse, which attracted vermin, and their populations were large enough to spread diseases that could not have survived in smaller, more nomadic foraging communities. All this evidence of declining health suggests that the first farmers were pushed into the com­plex and increasingly interconnected farming lifeway rather than pulled by its advantages."